After capturing a large area in Northern France and Belgium, German forces had remained on the defensive. The French army, commanded by Joffre, had fought a number of bloody small offensive actions during early 1915, but all failed to impact the situation. Joffre’s new plan for a major Franco-British Autumn offensive near Loos, an industrial area in north-east France, was not well received by British commander Sir Douglas Haig, but he had little choice but to comply, being that the British were still a junior partner in the ground war in France. At 6:00am, a major diversionary attack was launched by the 2nd Division, north of the La Bassee canal. The advance moved quickly into the German front trench, but as units approached the second line, they were assailed by heavy machine gun fire. A strong German counter-attack, then drove the British back to their original trench. 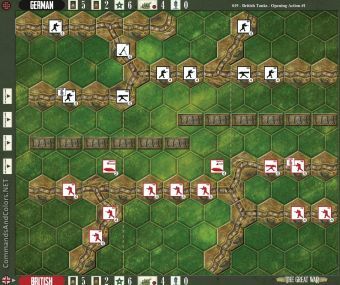 The British forces gain 1 Temporary Victory Medal at the start of their turn, when one or more units occupy any German trench hex in the front line, and for the second line, provided the first trench is also occupied. Place a Victory Medal, with the British side faceup, on the trench to indicate it is controlled. Played today as friendly - and also introduction to Vassal modules - with Chris (chris01). As Germans I gave up front trench pretty quickly and managed to move reserves to 2nd. Numerical superiority of British with my impossible bad luck in cards (zero recon cards) allowed Chris to continue attacks on my left and then on my right. We were pretty close in losses, but finally, with all German units concentrated, Britons gave away 3-6. 2 plays yesterday, a British and a German win. Germans should give up the front trench, and hold the communications tranches between 1st & 2nd Trench lines. Played this one yesterday with my friends. We played it as an "introductive real scenario" (instead of the 001 and 002 ones) 4 hands vs 4 hands (2 players per side, sharing cards and decisions). After first "no man land" rolls British managed to advance on the right following craters and avoiding wires, while german ahd some lucky reserve artillery rolls on british left side (lowering units strenght to 1 or 2). 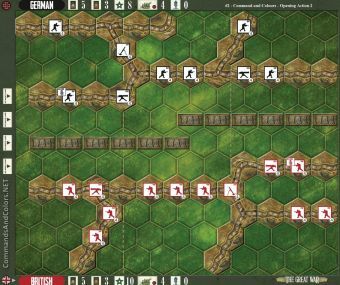 British advanced to German front line trench, gainging first 2 victory points (1 for eliminated unit and 1 for entering enemy trench). While German kept rolling reserve artillery with less luck (moving few battlefield units), British advacned more on the right attacking and killing enemy machinegun. With the help of some combat cards germans got some point, reaching partial result ofr 3-4. In the end British pushed the offense to enemy border line, killing both enemy mortar and bomber units. Players had some great time and really enjoyed it.